I have to wonder, is it Blake Shelton’s behavior that makes Miranda Lambert so insecure or is she just a basket case naturally? Every time we hear that Blake is gearing up to work with a female singer on The Voice we also hear about Miranda warning him up and down about cheating. Ironically, when Blake asked his wife to be a mentor on the show she declined! 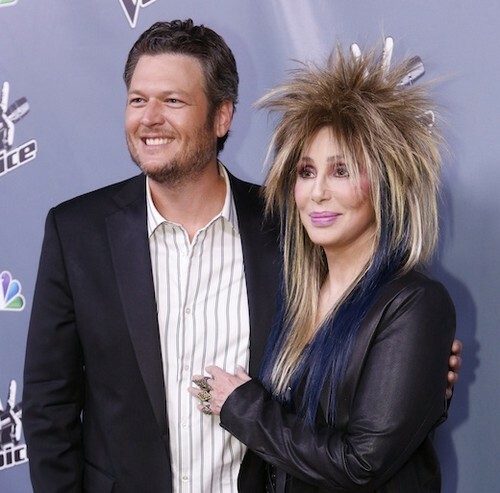 Anyway, according to the Sept. 30th print edition of National Enquirer 67-year old Cher has been tapped to mentor Blake’s team and it’s just the kind of news that Miranda didn’t want to hear. Of course Blake gushed like crazy about meeting the mega star and all Miranda could do was threaten him. Miranda knows that Cher is kind of a man eater and she likes her men exactly like Blake – tall, talented and in their 30’s so she warned her husband that he better steer clear of his new co-worker as much as possible. Miranda truly believes that Cher will make a very obvious play for Blake and she doesn’t exactly trust her man to keep his junk where it belongs. How on earth are Miranda and Blake still even married? I mean they are rarely together and whenever they are apart we hear rumblings of his cheating and her watching his every move from afar. That hardly seems like a healthy relationship to me! Do you think these two are ultimately just doomed to fail? Especially since it’s Blake’s behavior that seems to cause all the red flags. If he doesn’t reign it in a bit then Miranda probably would be a fool to trust him, don’t you think? Tell us your thoughts in the comments below!